Local folks who do not have a garden of their own are flocking to Iola's Elm Creek Community Garden (ECCG) and growing their own fruits and vegetables instead of buying produce that often travels hundreds of miles before it reaches the grocery store. Concerns over food safety and an increased interest in organic gardening have also added to the popularity. 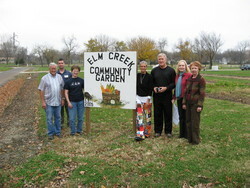 The site was an eyesore, so Val and Carolyn McLean donated the land for use as a public garden. Today the garden has 122 plots for gardeners, including those who are disabled. Folks all across Kansas are coming to Iola to check out the unique garden! ECCG offers raised handicapped plots and ground plots, and they promote healthy lifestyles, exercise, and good nutrition. They also provide tools and handicapped parking as well as free plots, water, plants, and seeds to the poor and under-served. 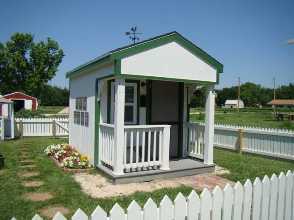 The main shed is designed to look like a farmhouse and is surrounded by a white picket fence with an arbor entrance. This shed also has a four-foot porch where gardeners can rest in the shade. The look is part of a rural farm theme selected for the garden. To enhance that look, small concrete animals were painted in realistic fashion and scattered amidst the benches and picnic shelters in the garden. In keeping with the farm theme, existing garden sheds were painted by local artist, Jim Smith, to mimic barns. A cistern pump, a kitchen pump, a regular hand pump, push-type garden cultivator and vintage mail box — all old farm staples — were donated. ECCG would still like to locate an old farm wagon as well. ECCG paid for the parts for the water hydrants and the City paid the labor. ECCG pays for the water and electricity. The city of Iola has been a big help in picking up bags of leaves in the fall from citizens in town. In efforts to educate children about rural life and growing food, school classrooms and other organizations visit ECCG every year. This is not meant for children only, though, all ages up to seniors participate in growing their own vegetables and fruits! Anyone can garden at Elm Creek. The annual plot fee of $25 provides gardeners with seeds, water, tool use, training and hands-on help. For those unable to pay or living below poverty level, the garden fee is waived. The ECCG has won lots of awards for its creativity and its healthy use of food. You can arrange a tour of the garden and hear the process of how the McLean's idea came to reality. If you want to just drive by, you can do that. But remember, you have to plant it to pick it!